The FBI placed the first woman on its list of most wanted terrorists Thursday, NBC News reports. Joanne Chesimard was a 1970s black radical who is accused of shooting a New Jersey trooper and fleeing prison in a daring daylight escape. 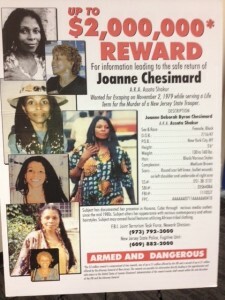 The FBI said Chesimard, who was part of the Black Liberation Army, fled to Cuba. Posted: 5/4/13 at 5:07 PM under FBI, News Story. With her resume she could be on the faculty of a leftist university, work for Bill Ayers in education or maybe as a czar in DHS.